No gigs booked at the moment! 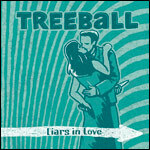 Treeball release their second album of 2006, I Dream Of Eclectic Sheep. 10 new songs featuring material written by Nick Triani, Astrid Swan, Janne Lehtinen & Michael McDonald. All ten tracks are available as a free download below with a copy of the cover for you to print. Treeball will appear on Radio Helsinki on wednesday, 25th April, at 6PM. Treeball are interviewed on Yle X's X Ryhmä on monday, 17th April, at 7.10PM. Read an interview with Nick (in Finnish) at desibeli.net. YLEX: You can e-mail them at ylex.toiveet@yle.fi or clickety-click here. X3M: Fill out the form here. Radio SuomiPOP: Fill out the request form here. Email us at info [at] treeball [dot] com.